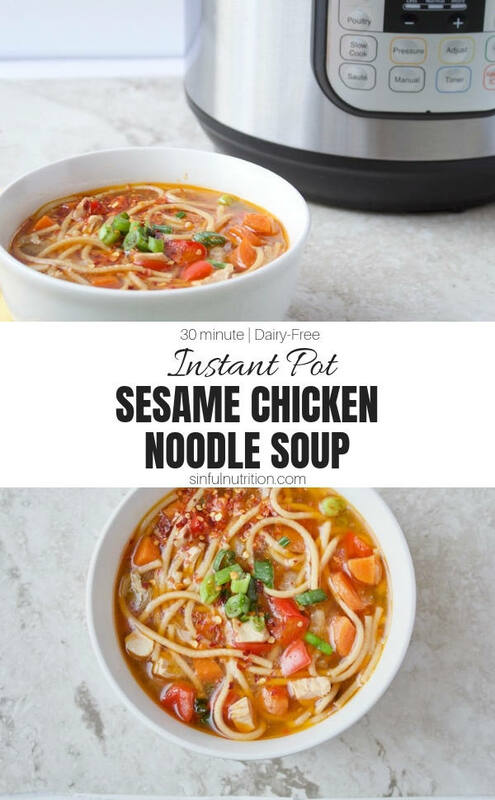 This Instant Pot Chicken Noodle Soup recipe is infused with the flavors of sesame, ginger, and scallion. Makes a quick and easy dinner, lunch, or any meal in between! This post is sponsored by Instant Pot. All thoughts and opinions are my own. Can’t see it? Find it here! Oh the weather outside is WINTER. When did we get here, and what have you done with Fall?! I’m genuinely concerned. Besides the mountain of blankets, fleece sheets, burning hot showers, and endless cups of tea, I’m getting by. And soups. Thank G.O.D for soups. Especially SOUPa spicy, open the floodgates of my sinuses kinda soup. Nothing wakes you up and lowers your heating bill at the same time as an extra kick in the pants..or bowl. Being the late in the game kinda gal I am, I finally staggered on the Instant Pot caboose just in time for soup season. At first glance, it’s a bit like navigating an air traffic control panel. Once you take a deep breath, and actually take a gander at the manual or the breadth of guides available online, you realize how freakin’ awesome it in fact is. Now nothing tops cold weather comfort much like chicken noodle soup. But have you had sesame all up in your chix noodz before? If you’re a spicy sesame noodle fan, you are in luck. Buy in bulk. Bigger packages of chicken breasts are cheaper by the pound than smaller ones. Cook some for the week on the weekend, and freeze the rest until you need it. Freeze ginger. Freezers are great, aren’t they? I can never use fresh ginger fast enough, but keeping it in the freezer makes it last much longer. Simply grate frozen ginger as you would fresh. Don’t buy pre-chopped. I know they’re a timesaver, but those pre-cut veggies cost you. Find some extra time during the week to chop veggies ahead of time to have them ready when you need them. 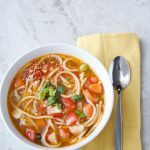 This Instant Pot Chicken Noodle Soup recipe is infused with the flavors of sesame, ginger, and scallion. Makes a quick and easy dinner or lunch any night of the week in less than 30 minutes! Heat Instant Pot on “Saute” setting. Add olive oil, carrots, onion, and red peppers, and cook for 5 minutes, or until softened. 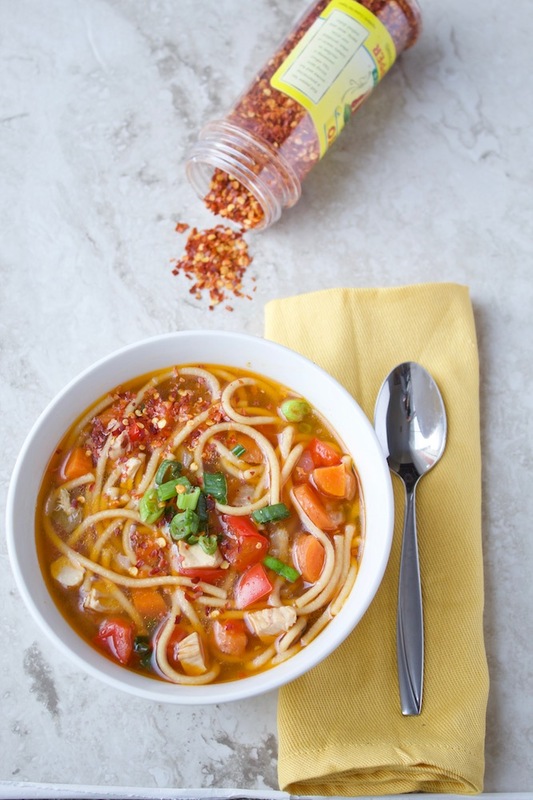 Turn Instant Pot off, and add garlic, chicken, spaghetti, broth, ginger, vinegar, soy sauce, honey, lime juice, and red pepper flakes. Put the lid on your Instant Pot, and turn valve to closed. Heat on “Soup” setting, and manually turn down time to 4 minutes. Once finished cooking, turn valve to release until all steam is out. Remove lid, and stir in sesame oil, and green onions. Top with additional green onions and sesame seeds when serving if desired. Vegetarian or Vegan? Sub out the chicken for tofu, use veggie broth, and maple instead of honey. Gluten-free? Use a gluten-free tamari and buckwheat noodles. Add chopped peanuts when serving for an extra crunch. Turn up or turn down the spice by adjusting the amount of red pepper flakes. Pin this recipe to your Soups board! Have you tried the Instant Pot yet? My family would love this spicy soup! Thanks Deborah! Hope they enjoy if you give it a try! YUM! My instant pot has literally been sitting in a box near my kitchen for like half a year, lol. This is the perfect motivation to actually learn how to use it!! Wait… this literally takes FOUR MINUTES?! How the heck do I not own this appliance already?!?! I love my InstantPot and am so ready to make some new soups. Will have to try your’s. Looks delicious! This sounds amazing! I’ve finally decided to get an Instant Pot so I need ALL THE RECIPES. This looks so yummy! I need to invest in an instant pot! We finally just got an Instant pot also and I cannot wait to make this soup in it! Love your video too!! Thanks Jess! 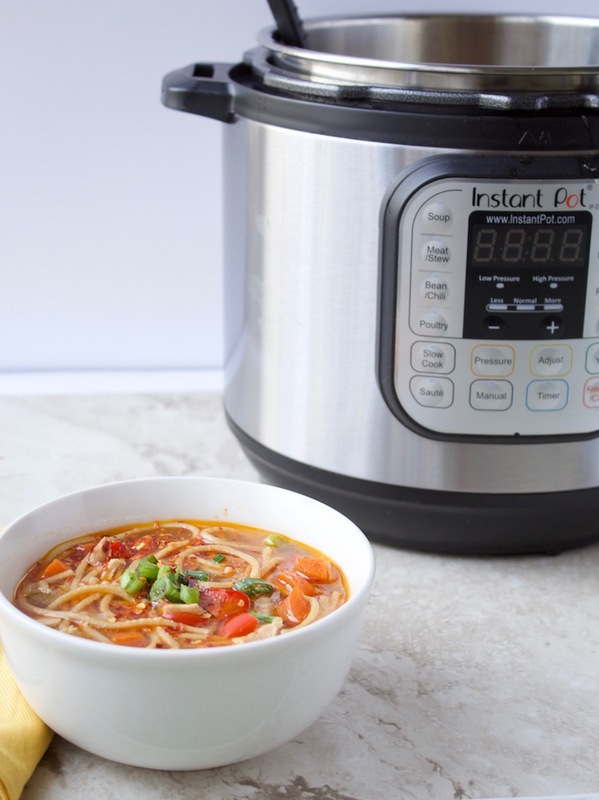 What do you think of the Instant Pot?! So far I just made shredded chicken for tacos, and loved how easy it was! But definitely need to put it to more use. planning to use it twice this week! You’re making me wish I had an instant pot! This looks awesome! This bowl looks so nourishing and tasty! Love the recipe! I have just one word for this – YUM! Chicken soup is one of my favorite thing during winter. It has healing powers – I’m not kidding. I love how delicious this soup looks. Love that is loaded with veggies. Great recipe!